Welcome to the new environment! This is the first big tournament with the Disciples of the Void Phoenix clan pack legal. 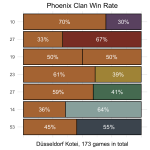 While this did have a few minor changes for most clans it was a big change for the Phoenix. 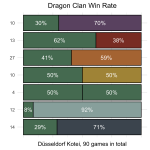 The common opinion is that Phoenix are now a top clan along with Scorpion and Dragon. Düsseldorf is where we get to see it in action. Day 1 was a busy day with 130 players in attendance. The venue was set in a very nice hostel, so players could stay there, get food there, and importantly get beer! We had a big showing for Phoenix reflecting, no doubt, the fun new cards. 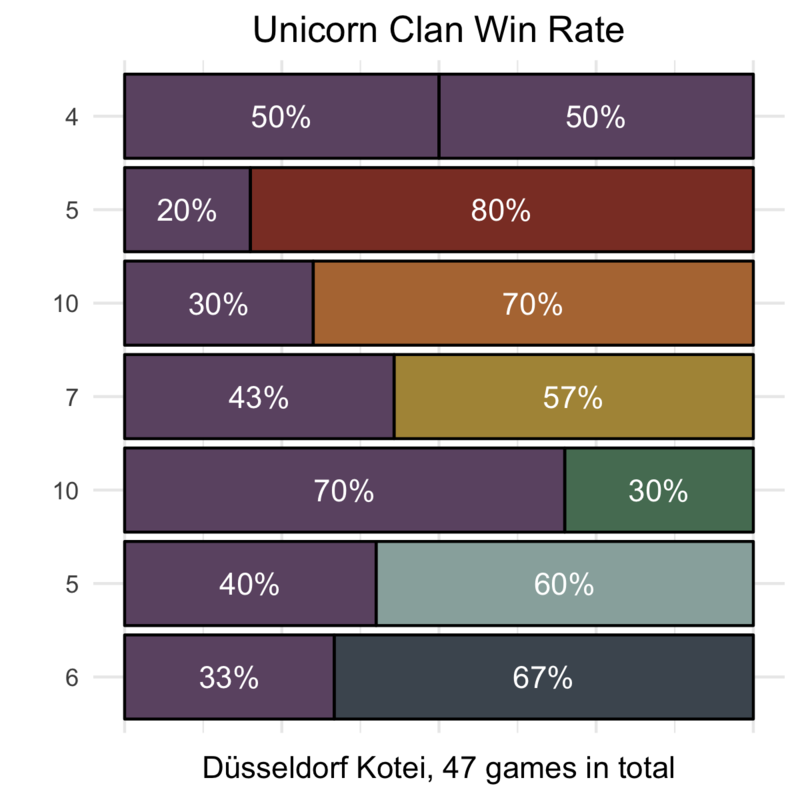 Everyone else was roughly even across the board with Unicorn having a decent showing of 9 (half the expected 18 if every clan was equal). 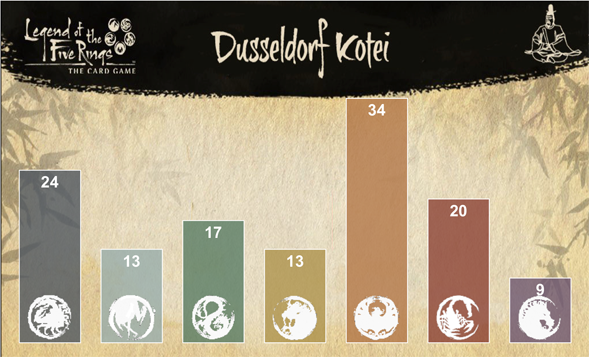 The tournament was run on Lotus Pavilion which allowed players to check their standings and round pairings online and very much helped everything go a lot smoother. After the first day we had 8 qualified and 7 clan challengers. 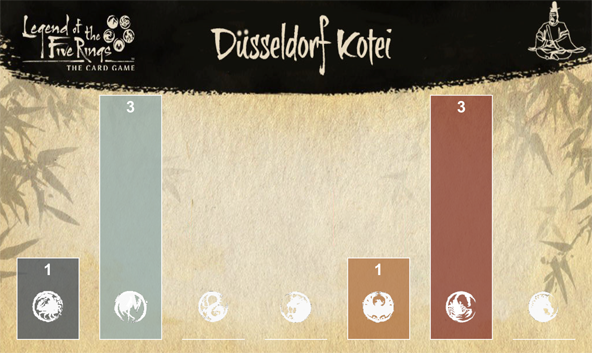 The qualifying players were 3 Scorpion, 3 Crane, 1 Crab, and 1 Phoenix. The best performers then were Crane and Scorpion in that order. While Scorpion was expected, Crane was not. 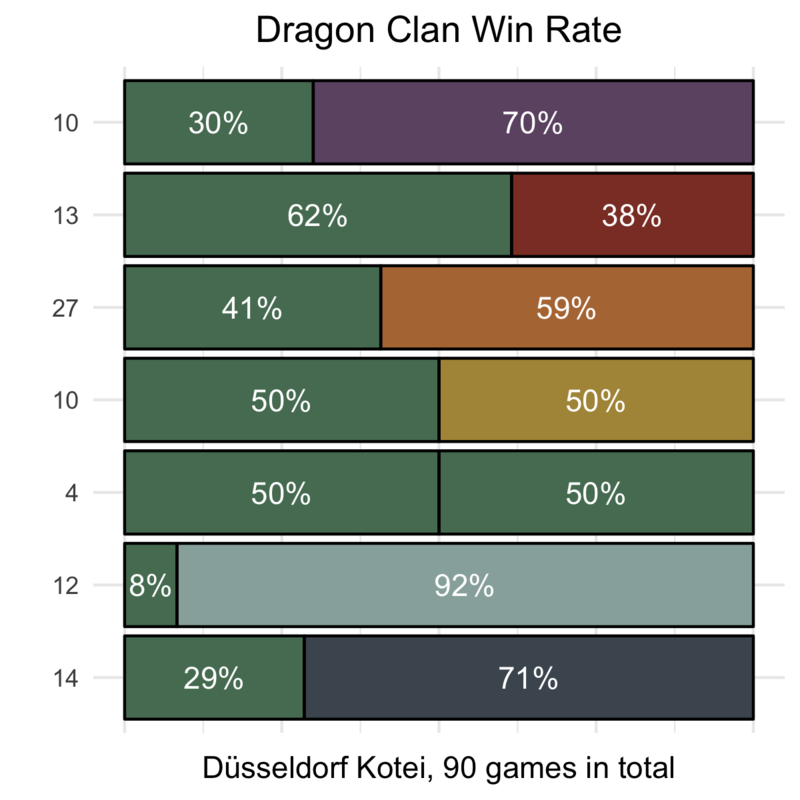 Although looking at the recent tournaments qualification rates, that might be something people need to reconsider. Phoenix despite great representation had only one qualifier which was disappointing. 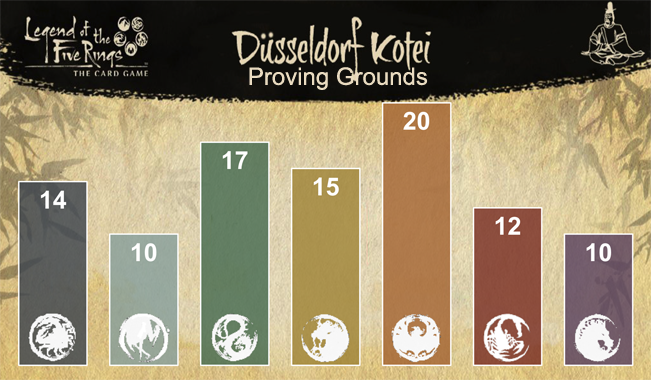 As this was their first tournament under the new stronghold we might need a few more events before the clan settles on a best deck and we can (hopefully) see their anticipated power. Dragon, similarly, had performance below expectations. 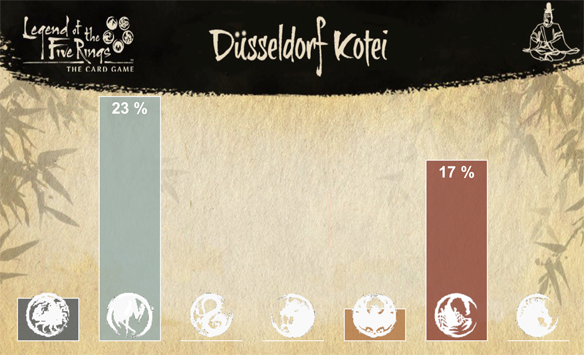 Scorpion, Dragon, and Phoenix were considered the top tier going into this event and that prediction did not translate into results. 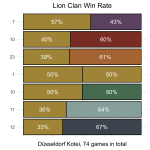 Win rates for main tournament (click to embiggen) this includes day 1 and the single elim rounds. 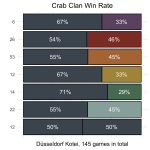 Crab and Crane are showing fantastic win rates. Crab has a small edge in that it beats out Crane. Scorpion and Phoenix are showing some strengths and weaknesses. Scorpion appears weak to Dragon, Crane, and Crab. Phoenix appears weak to Scorpion, Crane, and Crab. 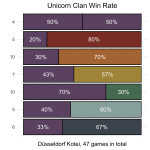 Dragon and Lion are both in poor positions and Unicorn is actually doing better than expected. 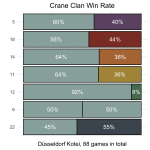 Dragon surprisingly has a great Scorpion matchup, but has a meme-worthy 8% win rate against Crane. Lion is poor to everything but Unicorn, while Unicorn is poor to everything but Dragon who they have a 70% win rate against. The usual cautions about small samples apply. We have to also remember that these figures are a reflection of what actually happened and don’t make predictions on what will happen in the next tournament or game. The final winner was Michal Michalowski playing Crab. After 6 rounds, two players remained undefeated. David Whitmann playing Crab and Alexander Wolf playing Phoenix. If you have any comments or feedback please post them in the comments section below. Join us on our Twitch stream every second Monday at 8pm BST, 9pm CEST, 1pm PST. Check us out on the Imperial Advisor website, podcast, and YouTube channel for more discussion about the L5R LCG. The Phoenix surge doesn’t surprise. I am hopeful though that they aren’ all new box and maybe, just maybe we have gotten to a point where at least one faction has two interestingly different functional decks that dont share 65+ cards with every other deck. Any vibe on Phoenix stronghold breakdown? Expected to have some of each Stronghold for Phoenix. Looks like that was true. Qualifying players are 3 Scorpion, 3 Crane, 1 Crab and 1 Phoenix (Lotus pavillon). Damnit! Lets pretend that never happen while I redo the numbers. I think I grabbed it from the standings of the round before. 41 Cards in the winner’s Dynasty deck. Intriguing. Double checked and updated. I transcribed incorrectly. The correct version now has 40/40. Restricted list just landed, back to the drawing board for everyone. Quite interesting results ! We can see more and more impacts from the player’s level on those match-ups and looking deeply in the results is quite interesting. Crab playing dishonor was a smart choice betting on the growing feeling of invulnerability amongst Scorps players. 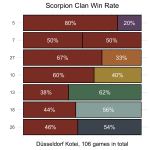 Would this mean that Scorpions should learn to play with a 3 or 4 bet instead of their usual 5 ? Interesting perspective ! Another astounding news is the Crane vs Dragon match-up. 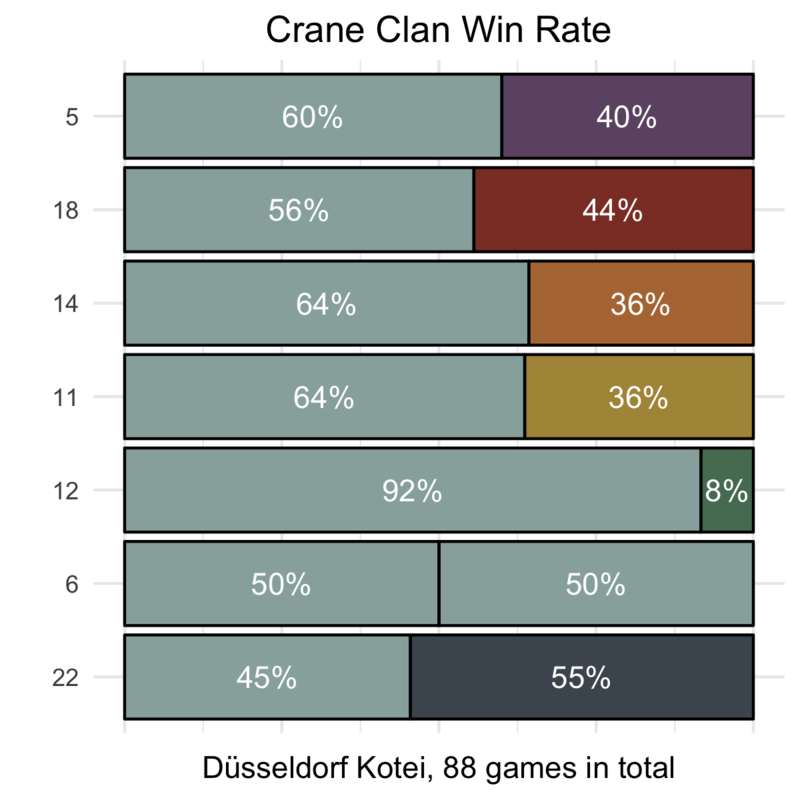 Niten turn 1 is already known as one of the worst choice to open vs Crane but i feel like very good Crane players were engaged in this Kotei (mostly frenchies) and that might explain the final unbalance. 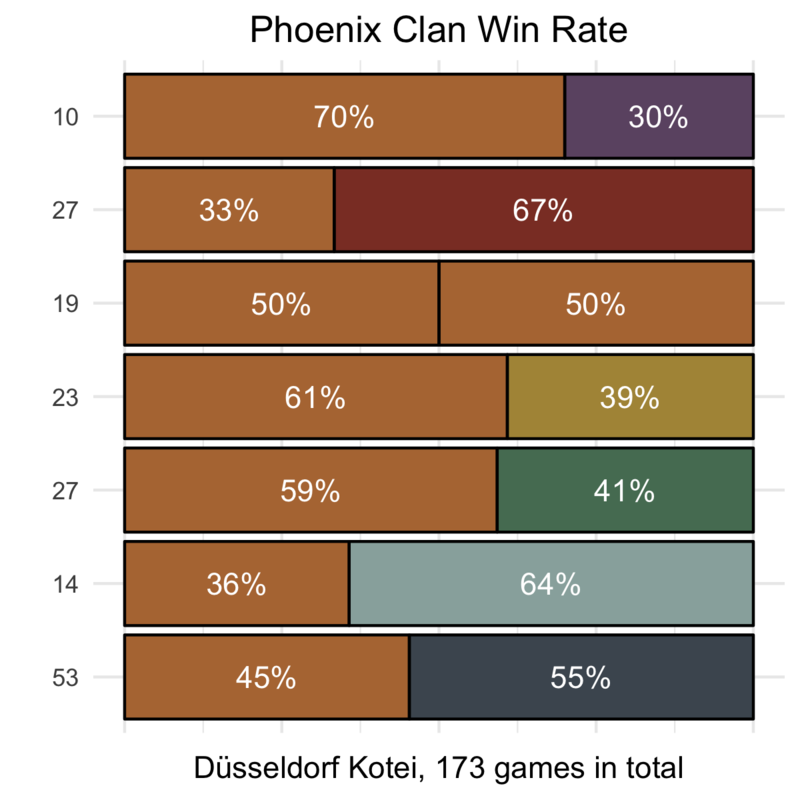 For my own loyalty, i am somewhat disappointed with the Phoenix results. And with the “Restricted list earthquake” i fear that we, Phoenix, have missed a one time opportunity. Tomorrows will be harder (think about the indirect damages inflicted to event-restriction characters with the restricted list, and put back your Fuschicho in the spirit world :)). All in all, great article (as always) and a lot to think about. The end of an era too. A new spring is coming. 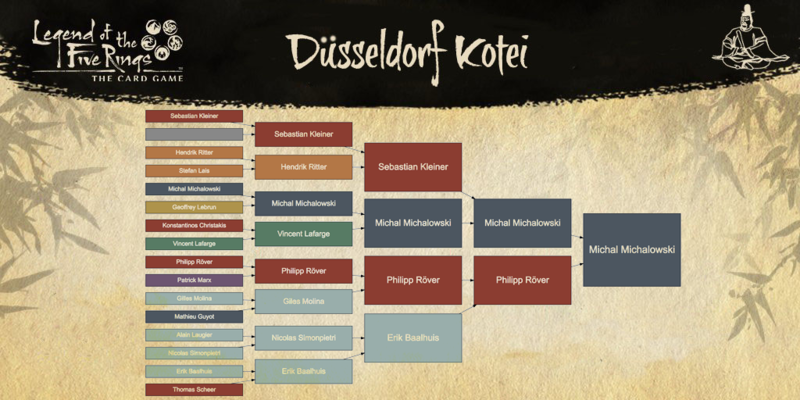 I am excited and looking forward the next koteis !